You don’t need to unfurl the Torah scroll too much, or turn too many pages in your Bible, to find the foundational verses of religion-based vegetarianism. 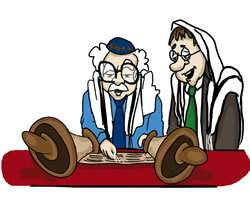 "Hey, Moishe, the Torah actually does say we're supposed to eat a plant-based diet. Who knew?" It’s right there in the opening chapter of Genesis. Discovering this changed The Beet-Eating Heeb’s life and the life of Wife of BEH, too. Their discovery occurred on Rosh Hashanah morning, 5766, when The Beet-Eating Heebs were still meat-eating Heebs. Head to the restroom and stay there for an extended period. But BEH and Wife of BEH chose a third option: Actually pay attention. and to every beast of the earth, and to every fowl of the air, and to every thing that creepeth upon the earth, wherein there is a living soul, [I have given] every green herb for food.’ And it was so. Every herb-yielding seed. The fruit. Every green herb. It seems filet mignon, chicken cordon bleu, and Thanksgiving turkey didn’t make the cut. Wait. It gets better. Or very good, anyway. Not just good, mind you. Very good. Only after giving Adam and Eve a vegan menu does G-d utter “very good,” or, in Hebrew, “tov m’ode”. It’s painfully obvious. G-d wants us to eat fruit, vegetables, nuts and grains. Period. Bible-literate carnivores, please hold your fire. The Beet-Eating Heeb knows what you’re going to say. And he is going to address those arguments in future blog postings. For now, suffice it to say that BEH and Wife of BEH looked at each other (lovingly) that Rosh Hashanah morning five years ago and simultaneously decided to become vegetarians. Posted on March 8, 2012, in Torah/Bible and Veganism and tagged Bible, Genesis, God, Rosh Hashanah, Torah. Bookmark the permalink. 21 Comments. That’s an interesting tidbit of Biblical lore and one my father – an ordained vicar – used to argue for the legalization of drugs! Thanks Alison, but The Beet-Eating Heeb would not describe it as a “tidbit of Biblical lore.” It’s actually a central component of the Judeo-Christian Creation story, even if most Jews and Christians haven’t thought through its clear meaning. I just have to let you know how much I love what you’re doing here. I was raised jewish and find a lot I can relate to on this blog (as I am also vegan). I love that you are telling others about these passages in the torah (or bible, if there are any christians reading this, as the torah is the old testament of the bible and still applies to christians as well as jews). I also like to tell people that G-d did technically give us permission to eat meat (and all animal products, for that matter), however, he did not do this because he wanted to. After the great flood, G-d made a vow that he would never destroy all of life like that again. In order for him to do that, he had to loosen the rules a little bit (or a lot, from my point of view). G-d knew that people were too quick to give into temptation and corruption, and that it would only be a matter of time before people would start up again. So to make things a little easier for us, he reluctantly allowed us to eat meat. The key word is that he *allowed* it — he didn’t mandate it. I try to remind people who practice judaism, catholicism, christianity or any religion based on the writings in the torah that if they truly want to show G-d that they believe that he ultimately knows what’s best, and that he was wrong about us — that we are in fact *not* so easily swayed by temptation and that we are *not* so easily corrupted — then they should do what G-d intended from the very beginning (go veg), as this was his ideal. If G-d wanted us to eat meat he would have said so and it would have been “very good”, but because he doesn’t want us to eat meat, it is up to us to live as close to his ideal as possible — what good jew, christian, catholic *wouldn’t* want to live close to G-d’s ideal??? And although to my knowledge this isn’t mentioned in the torah, I still have to let anyone reading this know about how horrible the dairy and egg industries are, as these industries directly contribute to many diseases that affect both our human bodies as well as our entire planet’s ecosystem. We also cannot forget that the animals in these industries suffer just as much as the animals in the meat industry, maybe more (in fact, all of these animals are eventually slaughtered for meat when their production declines, as our “thank you” to them). You're a valued contributor to my blog, VR, and you know The Beet-Eating Heeb follows yours. You are obviously ignorant of the rest of the Torah. The Rambam says very clearly in Hilchot Deiot, chapter 3, that someone who deprives himself of anything that G-d allows, like meat and wine is a SINNER. He says later on that someone who denies himself meat or wine for a month has transgressed 4 commandments of the Torah. The Rabbis learn your very verse in the Torah not to exclude meat, we learn from Chazal that this limitation on Adam was only to restrict Ever min ha Chai. This ideas of religious vegetarianism is contrary to all the Torah. Your message is 100% wrong and you should just call yourselves sinners. Yosef, The Beet-Eating Heeb appreciates your readership. However, BEH wishes to keep the debate civil and mutually respectful. The Beet-Eating Heeb will be examining other elements of the Torah in future posts. If you think it’s a sin to disconnect yourself from the cruelty and killing of the factory-farming industry, then you and BEH have very divergent views about morality and Judaism. Here, Bill is correct, we make a Hekesh (connection) between the green herb from Noah, which we know excludes Ever Min HaChai (a part of a living animal) which draws back to the first restriction on Adam where we learn that he also was not permitted to eat Ever Min ha Chai. You should also know that we have a mishna from Avot of Rabbi Natan which explains that the heavenly angels were preparing an ox dinner for Adam when the snake saw this and was jealous because he wanted to eat meat like ADAM. This is why the snake wanted to take Eve for himself and replace Adam as the king of nature. So we learn that Adam certainly ate meat and it was for this that the snake was jealous and as a punishment was forced to eat dirt. This is all in the Gemara, our source of Jewish morality, law and ethics. Unless you have another source that I don’t know about. One other point, you should read the commentaries of VERY good. What could be better than ton? Chazal tell us that Very good is the Sitra Acher, the Satan, this is the evil inclination to want to make good into very good. Not as nice as you want to learn. The Beet-Eating Heeb is beginning wonder whether you’re serious Yosef or if this is all a joke. BEH has a hard time taking such theological contortions seriously. These are not theological contortions, this is our tradition given to Moshe at Sinai. If you have trouble believing in the Oral tradition then you have trouble with Judaism itself. I am not making this up, this is what is written in our holy books and the Gmara. Like The Beet-Eating Heeb said: Bible-literate carnivores, hold your fire. BEH will get to that verse in a future post. He says that after we demonstrated our incapability to abide by his reasonable rules (the great flood). It is our duty to show G-d that we are not as easily corruptable as he believes us to be. We can change. G-d knows us better than we know ourselves. He knows what is good for us and what we need also what we don’t need. We are still transgressing commandments that he gave us at Sinai to this day, otherwise we would be already redeemed. If you want to show G-d that you are not corrupted, then you have to keep all his mitzvoth and not make up commandments that he did not give. The Torah says don’t add and don’t subtract from My commandments. The Rambam says (H”Deios P”3) One who abstains from allowed pleasures is a sinner, how do we demonstrate our incorruptibility if we impose on ourselves restrictions that G-d did not dictate?? Yosef is guilty of using a straw-man argument. In other words, he is accusing The Beet-Eating Heeb and Vegan Rabbit of saying something when they said nothing of the sort. Torah ideal. That’s an important distinction that Yosef keeps missing. Besides, what does an ethical person who is interested in living up to God’s explicitly stated ideal find pleasurable about consuming the muscle, organs and secretions of sentient beings? Since we’re on the subject of the ten commandments, I was just wondering if you might recall the very first one? I think it goes something like “thou shalt not kill” or something of that nature? now correct me if i’m wrong, but i don’t remember there being an asterisk saying that this applies only to human beings and is not a general rule. Also, if one who abstains from allowed pleasures is a sinner, then how does that apply to someone who takes no pleasure in eating the mutilated corpse of a living creature? Is empathy something you believe G-d is not understanding of? You are very sweet vegan rabbit, I am sure that you only want to see happy people and loving creatures in your life. For someone who takes no pleasure in eating flesh of meat, be he Jew or Goy, there is certainly no mitzvah to eat of it, even on Shabbat or Yom Tov. As Jews, we have a ritual slaughter that was given to us by G-d, in the Torah. This word for slaughter (Schitah) has no relation to murder (Harigah) in the 10 commandments. Now, if you are a Goya, your only restriction is 7 commandments that G-d gave to Noah, one of which is not to eat from an animal while it is still alive and you don’t need the very humane schitah process, but you are welcome to eat at a higher standard, only of course, if you like to eat meat.